See sold data anywhere in the Valley. If your looking for Gilbert, AZ. 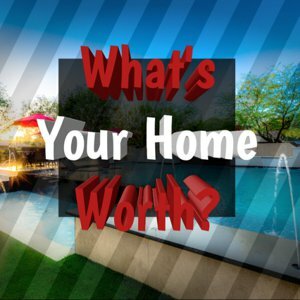 homes for sale, you will be delighted with our Gilbert real estate website- including MLS search for all Gilbert and Phoenix metro area homes. 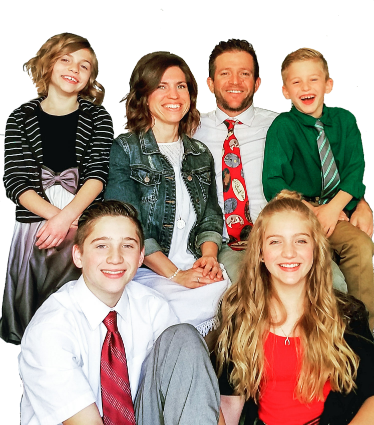 We have spent hundreds of hours and thousands of dollars creating the easiest to use and most information packed website for the entire Gilbert, AZ. real estate market. We do not only serve Gilbert, you can also browse the entire Phoenix metro real estate market. Accurate and up-to-date information is key when looking to buy a home in Gilbert's real estate market. With technology at our finger tips and listings available to anyone with a smart phone, it is imperative that our clients have access to the latest in real estate technology. Why is this important? All home buyers have one thing in common, they all want the best deal on the most beautiful house on the market. The Gilbert real estate market is hot and homes are selling fast. Chances are if you like a home everyone else will to. This is where our hard work comes into play. Unlike Zillow, Trulia, Realtor.com, and the rest of the big named sites, we provide an accurate and up-to-date website that is updated within minutes of anything hitting or changing in the market. Whats this mean to you? You won't be wasting your time chasing listings that are already under contract or sold. It also means that while your competition is out chasing down old listings you can score the best deal on the most beautiful house on the market. This also means that your not going to be getting called by an in-experienced real estate agent that was picked by a computerized round robin selection process. This is how those big named websites operate, they sell zip codes to agents for huge profits with no consideration to experience or talent. We have more than 14 years experience buying and selling homes and we will personally work with you. Our Gilbert AZ, homes & real estate website is exactly what you need to gain the edge on the competition. 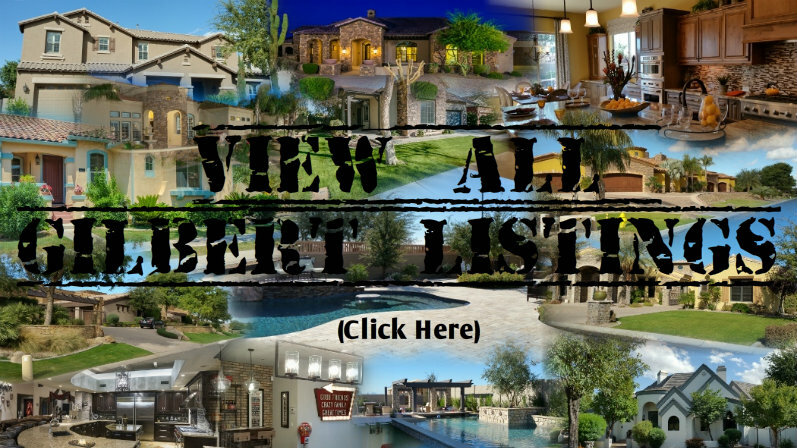 View pictures, information, and homes for sale in each of Gilbert's communities below. Just click on the picture. 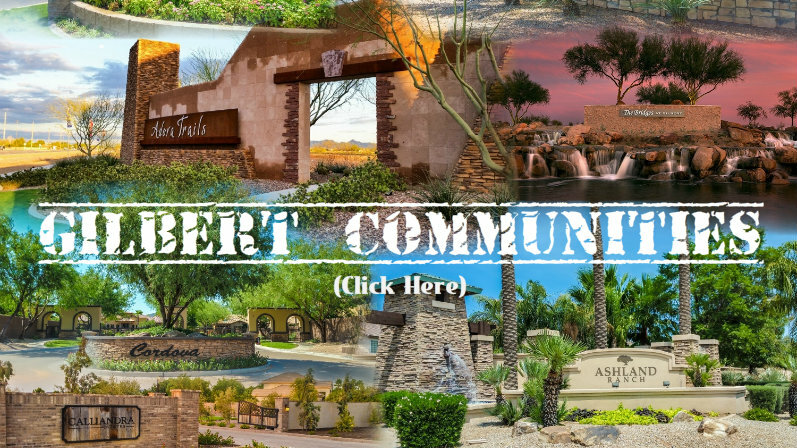 Each one of our Gilbert community pages have homes for sale, pictures, and in some cases video of the community. 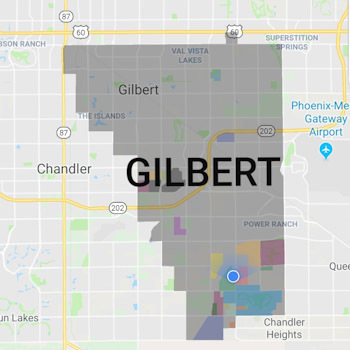 Our Gilbert homes site is the most easy to use and information packed website on the web for the Gilbert Arizona real estate market. You can find everything you need to know about each individual community. We're adding information daily, so if it's not there, just ask and we will get it for you. We are truly your "Gilbert Real Estate Experts." We personally research, drive the neighborhoods, take the pictures, add videos, and all the content ourselves. We do this so that we can provide excellent customer service, unique knowledge, and a better home buying experience. Gilbert is where we work, play, and raise our family. We want to be your go to real estate professionals, let us prove it. Gilbert Community Pictures, Information, & Listings.